It is possible to lose weight without exercise, but with regular training it can be done faster and more efficiently. How to choose a workout to achieve maximum results? Is it true that the most effective way to burn fat is cardio training? It is true. With the help of cardio, you can quickly and easily improve your health and shape: you train the heart muscle, the respiratory system, burn subcutaneous fat and lower the cholesterol level. We offer you to try this great bodyweight circuits to get the heart rate up. #1. Inchworms. Stand on the floor. Then place your hands on the floor and make steps by your arms to get a plank position. Repeat 5 times. #2. Bodyweight Squats. Stand on the floor. Place your arms in front of your breast. Do squats. Repeat 15 times. #3. Renegade Rows. Take a plank position with dumbbells in your hands. Then bend your elbow one by one. Repeat 10 times. #4. Push-Ups. take a plank position and do push-ups. Repeat 10 times. #5. Jump Squats. Stand on the floor. Do a squat and then jump up. Repeat 10 times. #6. Plank Hops. Take a plank position. Then do hops to the left and to the right with your legs. repeat 10 times. Very many people do not like cardio training and try to avoid it whenever possible. However, now there is a very large choice of cardio exercises for all tastes and preferences, so you can choose the most suitable option for yourself. 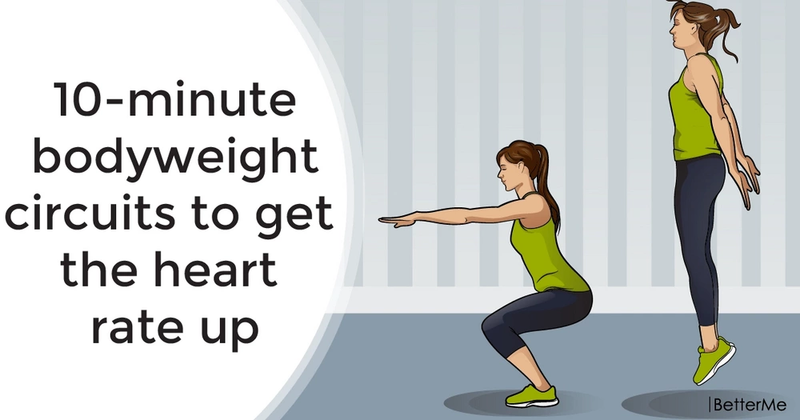 If you want to get more tones body, you can add strength exercises to your cardio workout.